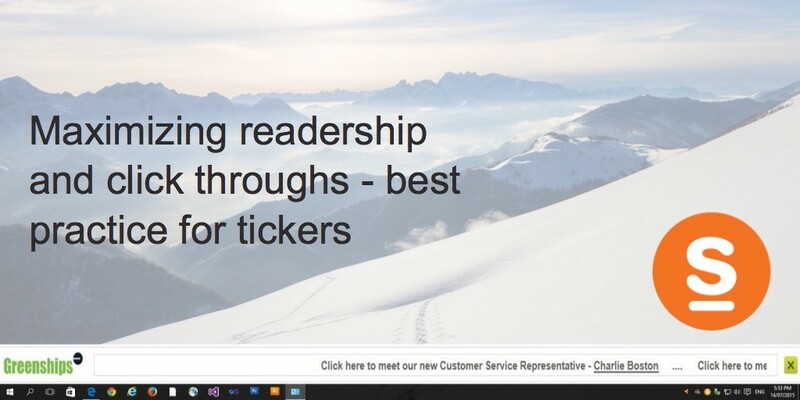 What's the best way to deliver your ticker headline message - to maximize readership and responses? Paula: ...from SnapComms here. Thank you very much for joining us today. We're a little half hour, maybe a little longer. Best Practice workshop on our ticker scrolling tool. And today we're going to go through a bit of the same format as we've done on other days. My name is Paula Cassin. That's a good picture of me on the left. And Maurice is joining me today, I'm really happy to say. Maurice is my colleague here in North America. So I don't know if you wanna say hi. Paula: Yeah. So Maurice is gonna be managing, chiming in with questions and helping keep things running and just correcting me too if I get anything wrong. And you know I've included Phil and Kim. Phil and Kim are part of our team that have been you know that are working through all of these and supporting all of you. But Kim is travelling today and Phil is away at a conference. They may come on board or not, but best of luck today. All right. So let's keep moving on. Just incase anyone is unfamiliar with who we are, SnapComms. We are a enterprise software company, and we've got 1.3 million users now on our platform, in over 50 countries. Over 400 corporate customers, and we're very focused on support and you know business scenarios helping you reach your employees. So those are a few facts about us. And I wanna ask you a question as, if you've been on one of our workshops before you know we like to do this. The question is are you using the tickers already or not? And let me just throw up this question on screen for a couple of seconds. So hopefully you can see that. And I'll share the results once we're done. I just wanna know who is familiar with tickers and the tools already, and who already is using them just so that we can talk through it. Okay. Let's see here. I'm gonna close. This is interesting, and I'll share this with you too. So I thought we were gonna have some people using tickers but most people today they use other SnapComms tools. And we have a lot of people who aren't new to SnapComms, so fantastic. This we're gonna get into some of the details today on how you can use tickers, so I will make sure to give you context as much I can and use the question, that question area too which you'll see in your GoToMeeting panel. Okay. Use that if anything doesn't make sense. I'll do my best though to move forward here. All right. And let's get on to what we're gonna talk about today. We're really wanting to give you some tips and some insight into how people are using these ticker news feed scroll tool that we have, and give you something that you can apply immediately if you're using our tools or testing our tools. Practical takeaways is what we're after here. All right. So you'll have to let us know if we succeed in doing that. And here's what I'm gonna cover. And I threw a visual in rather than just a list. There's sort of four areas that I wanna talk about today. First off the message itself when it comes to putting a news feed ticker on screen. The message that you wanna convey, we'll talk about best practice there. And then all the bells and whistles, all the gorgeous stuff you can do with delivery. After that we'll spend a little bit of time on you know how to make sure what you're doing is getting the result that you want and how to set everything up so it's consistent and you take as little time as possible getting your message out. All right. So that's the flow. And let's get into it right away. Let's get into the message itself. So visual templates. Now, I'm gonna just back up one slide here because if you see, you may have noticed on my screen there's a little blue thing at the bottom right corner here. It says "medical hospital." You probably can't read that but this is actually a ticker that's been sent to me as an employee and I'm just gonna pull this up on screen so you can see what a ticker looks like. So what we're looking at here, and by the way this is very smooth on my screen. Sometimes with GoToWebinar and a screen broadcast it gets a little jerky. But just you know it's smooth on my screen. And if I was working away, this message can appear on screen and you know give me notice that there's something that's really important we've gotta go have a look at it. And in this case I can click on this headline, it's gonna take me through to more information. I'm not gonna do that right now though, but I just want you to see what a basic ticker looks like on screen. All right. And I'm gonna close it. Maurice: Excuse me, Paula. Sorry, Paula. Maurice just here. We have an early question. They wanna know, can a ticker be moved, can be moved on the screen? Paula: It can actually. Yeah, good question. So most companies are putting it right above the task bar, but an individual user can set their preference for where the ticker is gonna scroll. I can have it right in the middle of the screen or at the top or wherever is convenient. If I put this up top and close it, that's where it will come back. The next time it scrolls it will come back there. You can see we've got a little tab staying on screen, and this what we're looking at here, this is just one way you can deliver a ticker. You can put a little indicator on screen and have your audience click. This is called a retract mode ticker, and this is set to force me to click through. It's gonna stay on screen until I click through. Useful for something very important, so I'll do that now. And you can see this one took me to a webpage. I wasn't gonna do that but never mind. I couldn't really get it off the screen until I did, so let me go back to the presentation here. All right, so that's a little bit about what a ticker is. And now it probably makes sense that you've seen one on screen and here's some other visual representations. The first thing when you create one of these messages, you can choose the template for this message. And this is a great thing to really leverage. You can give people a strong visual cue, you know, have it bright red if it's sort of an emergency type thing, use corporate branding of course. You can get pretty crazy with shapes and sizes. And you can have as many different visual looks and feel for the ticker as you like. Here are some examples that we have in our trials. Daily news, weekly news, staff news. You know, you can put in a logo or some wordings so people know what the category of information is that you're sending out using that visual template. And just so you know, we do embed map all the designs into SnappComms. We scale them so they'll fit no matter what the screen resolution is of your audience members. There's always variation. And also the ticker, if you send it out to a tablet or a phone, we automatically turn that into a static message on those devices' operating systems don't let you scroll something on top of your working screen, but you can still get cut through using one visual message. But there's links there. I'm gonna send you the slide decks so you can dig into that if you like. But onto the second part, the message itself. So when you're setting up a ticker message, there's really two parts. You've got that headline and then you've got what's behind it. And there's one option, the message window that I'll talk about too. So in terms of best practice for the headline itself, I've got a visual way to show you this. So I've got a static representation of a ticker on screen. You can see it's just a little sentence there that's repeating. And here here's another one. Now, if we look at these two, the second one is a little bit more clear. It's telling us "learn more." We want you to click, we want you to click and go do something. And here's a third one, more generic. We want to click but we really haven't told them anything. So it is important what you write in here. And I know it seems a bit obvious but you'd be surprised. Best practice for tickers is gonna be get the minimum viable message. You know, what do you want them to know or act upon? What do you want them to absorb? Get that into your headline. And then if you need them to click on it, you do want to tell them to click through to learn more. And the reason for that, and this is a headline...When you're sending a single headline it's usually to get people to take some sort of an action, right? But everyone is used to seeing tickers on a television screen where you can't interact with a text, but with tickers of course you can. That's one of the huge powerful things about this tool. We can drive people through to your internet pages or your internal resources or anywhere you need them to go. You can get them there much faster than with an email or even with a text message at times. So those are the two best practices for a single headline. And now let's...I mentioned television screens and that you can achieve with a ticker too. We have what's called a Multiple Headline ticker where you can have as many different headlines scrolling at one time. This is great to use maybe if you're sending out divisional news once a month or perhaps it's a contact center team, and you have the daily reminders that go out when people show up on shift. They log in and they get all the most important things they need to know rather than having it buried in their inbox. So there's a lot you can do here too. Same kind of thing, you want your minimum viable message. But with this multi-headline ticker, another thing you can do, you can add in category headers. If you look at that second line, we've got some words there helping to give people cues about what the topics are, and on the very bottom you can see we've added images as well. There's a lot you can do there. You can get quite fancy with what's going out on a Multiple Headline ticker, even more features there. So best practice, somewhat the same. Make sure your message is clear, make sure you tell them if there's something that you want them to click on, and then use the visual cues. You can go really far by adding in visual cues to match your messages. Okay. And now in terms again of message, there's one more thing to mention. You can simply send a headline where people read it and they close that headline. That's all there is to it. You can send a headline and you put a URL behind it. Send them to your resource that already exists. But the third option is the one I'm talking about now. This is where we brand up a matching message window for you, matches the branding of the ticker that you've chosen. So if there's information you need to send people that you don't have somewhere already online, you can get that out really fast. And when they click on the link in the headline, they go to the message history window. And there again it does matter. You've got a lot more visual realistic on your page and just make sure you're using best practice when it comes to designing that message. You can see here these two messages, they have the same contents, but the one on the right is gonna take a lot less time for people to absorb that message and know what you want them to do. So you're saving them time, and you're gonna reach more people too. So people are gonna read the one on the left, just scan it and close it. So make sure you lay out clearly what you want them to do and highlight what you want. So same best practice. Make it easy to absorb. If you have a call to action make it super clear, and use visuals to your advantage. Okay. Maurice: Oh, good question. You're gonna ask a question. We talked earlier about encouraging the audience to ask questions throughout the presentation. I'm monitoring the questions chat, so if you guys have any questions, you don't have to hold them to the end. Please feel free to pose those questions now and we'll address them. Sorry about that. It's my fault. Paula: No, not. Go for it. You know I have this question, I'm gonna save it for little bit later because I wanna show you some scenarios next. If we had a lot of people on that were using the tool already, this question would make sense, but I'm gonna save this. I wanna show you a bit more about tickers, and then I wanna ask you which one do you think you'd use? Which one do you think makes the most sense for you? So we're not gonna pull that up yet. Okay. Now, let's look at all the fantastic things you can do with visual display with the ticker. It's just, sky is really the limit. Any sort of visual display you want we probably can achieve with the fantastic settings we have. The way I'm gonna talk through this is through scenarios because there's so much there. So here's the first scenario. This is like an emergency scenario where, "Oh my gosh, we've got retail stores, we've got credit card processing outage affecting a region." And we've seen this happen before with some of our customers. So you've got point of sale computers in retail stores, you've got different employees that will use that computer. There are shared logins on that computer, right? So we wanna make sure if you send something by email or if you send them a voicemail, voicemail probably would be the only way you could reach all your stores, because even texting you're not gonna have everybody's personal text number. It's really difficult to get that. So here's what you want. We want anyone who hits that PC to do a transaction or you know log in to their job or something, we want them to know immediately what they're supposed to. What's the backup plan right now? You know go here to see the instructions for manual credit card transactions, whatever it might be. We want that message to stay on screen until the situation is over and we don't want it to interfere with anything else, right? We wanna scroll, but we don't want it interfering with them getting their work done. So for settings, we have settings for that. If you wanted to send that kind of a message, you would send it with what we call "Always On." You can send a ticker and have it the way it is on television programs where it's always on. The end users can't turn it off, it's gonna be permanently on screen. And the second important setting for this would be docking. We have what we call docking where we won't overlay anything, we'll put that ticker between the task bar and the working application. [inaudible 00:15:26] the working application. And in order to remove that kind of a ticker, you have to...the person who sent it has to either turn it off or it's going to run until wherever expiry date you set. Expiry date, time window you've set. So yes, here we go. So this is what it looks like. On the Advanced tab, this little screenshot, you can see scroll frequency. That's the first setting where you can control how many times is that headline gonna scroll on screen? And for this particular scenario, we would choose the most extreme where users can't get rid of it. All right? So that's the most extreme option where you're the most interrupted because you need to be because there's something so important you have to make sure everybody who's working active on the computer sees it. Okay? And docking. Docking is here too. It's just another control. Before you send it you change that so that we're not gonna cover up any controls. And you can imagine, if we've set something to stay on screen and they can't remove it, they could move it. You know, they can move it up and down like I showed you earlier, but if we dock then they don't even have to worry about that. Right. And then just so you know, it is really easy to pull a message. When you send a message, it'll set some dates and times how long you want it to run. But if you ever wanna pull a message, you simply go into administrator portal, you tick a box next to that message, and you hit the Disable button and that's gonna pull it up everyone's computer. That's what would stop this kind of permanent message. Okay. So that scenario is not that common, it's really an emergency scenario. It's nice to have that in your backup but you're hopefully never gonna use that. But let's look at a few more. And I'm gonna go down in terms of level of intrusiveness, level of importance in terms of these messages. So the next one, let's look at an outage notification. Okay, we've got a website, the website is down. Oh no, it's affecting our business. We really gotta make sure everybody knows and we want them to acknowledge that they've seen this message so we know that they know what to do. So here's what we want. We want a ticker on screen and we want it to stay there. We wanna make sure that they've seen it, right? We want them to interact with it and we want them to click through so that we know they've gone through to the instructions we have for them. Right? So this is a scenario where we don't have a shared computer, everybody has a unique username, right? So we can target people specifically and we can know when each individual person has read this message. So here's the key settings you'd use for that. Instead of Always On, you'd use a scroll frequency where, "Let's leave it on screen until they click through." And you can also use Recurrence. Recurrence is where if they close that down and they haven't clicked through, we're gonna send it back until they click through. We really want them to click through. So you can have this come back. It's considered unread if they haven't clicked through so we'll send it again. And this, this again this is on the Advanced tab. Some more settings here where you have complete control over how do you want this message to come back later if they haven't interacted with it or read it? And I would say recurrence is great. Every once in while you're gonna get someone who has...You know, they've just gone off to get a cup of coffee, their machine is showing as active so we're gonna display that ticker on that machine. And if they don't close it down, if they don't hit the Close button or if they don't click through on a hyperlink, you know they may not be there. They may be ignoring it, but they're probably just not there. They're off doing something and their machine hasn't logged out yet. So Recurrence, make sure you reach those people that you don't have...you know, you're gonna have displays on screen but if they haven't touched anything on that ticker, we don't really know if they saw it or not. So it makes sure that everybody has seen it. Hopefully that makes sense. Okay. News feed. Oh goodness, my little animation, I didn't do it on this page, did I? So here's the next one. This is a news feed scenario. So this is where you're gonna have multiple headlines. And of course a multiple headline scenario, you probably don't want, and I'll pull my example up on screen. Let's see if that will show. Here it is. And you can see it remembered where I left my ticker. And I'll pull that back down. So here's a Multiple Headline ticker. Something like this you probably don't wanna force them to click through on every item, right? With this, when you're sending multiple news items through, most of the time people...We have a lot of contact centers that would do this once a day , and they love it because people could show up for the afternoon shift or the evening shift. These titles are showcased, they're not buried in email from 6 a.m in the morning when the first shift got them. They're the first thing they see. So it really depends on what you wanna do, but some of the settings you can use and it's really up to you how important is it that they click through on everything? If you want them just to read the headlines and maybe click through on one and have it come back later or is that the end of it? So the settings here if you look at this bottom section. And what I'll do is I'll close this ticker out just so we can focus on this. So key settings. Of course multiple headline ticker. And that you use that in the Administrator Portal so you can set up multiple headlines in one item. And scroll frequency, you don't have to set a time limited. Maybe you have the scroll five times and then it disappears and maybe it comes back once a day for three days, and we try to reach them across three days. It's really up to you. But some other great settings we have are Dismiss when Closed. And that's if they interact with it at all we're not gonna repeat anything. We're not gonna come back later. If they're not there the first day and it disappears, we'll try again the second day. But if they close it then all the repeats are gonna stop. We really don't wanna bother them, we just want them to be aware of what's going on. And Retract Mode. Now, that's the little tab that I had on my screen at the very beginning. That's another way where you can put a little visual on screen, but we're not gonna scroll until they're ready. They can click on that. You can have them click on that to launch it when it's a good time for them rather than have it scroll at the time that you've set. So those are some options that could be really good here when you're putting out important but not urgent type information that you want them to absorb over a longer time period. I think that's the key to it. So now, just so you know, there's two places you'll find these display settings. Most of them are on the Advanced tab. These are a lot of settings that you can preset, pre-populate. You can put your defaults, set up your defaults so that they're always you know your preferred settings. And then on the Content tab, you can see that's where we [inaudible 00:23:14]. Here's a few options that also have been built in on that tab itself where you're putting in your headlines. So that's a reference for you for later. So you know it's really up to you when you're looking at the message that you have to get out and you wanna use something dynamic like the ticker. When do you want it to arrive? How soon do you need them to absorb this information? What you want them to do? You know these are the kind of questions you're gonna ask to decide which of these display settings make sense for you. And one more scenario and this will pretty much get us...finishes off a bit here. So this is a reminder setting. A lot of people love the ticker just for reminders for specific groups of people. And there's one company up in Canada, and this an old example but is still extremely valid. At their headquarters they would have an all-employee quarterly meeting to go through results, and they had a live stream option for people that were in other offices around the country which is fantastic. Good for them. And they would send out invitations to the live stream but not that many people attended. What they wanted was to encourage people to attend. Get them chiming in to those live streams, not getting distracted by other work. They really wanted to engage other people and drive up the attendance. So what they did, they used the ticker scroll and they set this. They wanted a reminder to go on screen you know 10 minutes before the live stream begin with the link. "Here's where you go," make it really easy for people to log in at the exact moment. And you know you might have Outlook, you may get a reminder, but having a visually and a corporate-branded dynamic ticker, I think it's really conveying how important it is to the company that you show up. It goes beyond just a normal event reminder. And it really worked, it worked for them. What they did, they set that scroll up to be unlimited. And the key here were the dates. So what they did was they set the exact start time for that ticker. Tiny window, 10 minutes. "We only wanted our screen for this specific 10 minutes across all time zones." We wanted to start 10 minutes before the live stream event and stop when it started...I don't know. I can't remember if they...You know they probably left it on 5, 10 minutes into the live stream. And the other key setting is "publish early." You can send this out, you can set your target dates and send it out the day before. There's a little bit of a delay between publishing and visual appearance on screen. So what you do is send this out the day before. It actually will be delivered to all the computers, all the devices. Now, this is PC or computer specific but it'll go out to the computers. It'll be held in the SnapComms software but it'll be invisible until that exact date and time. And all of that is controlled on the Target Dates tab. And here you can see you can set the exact start date and time, the end date and time, when you want it to disappear. And we even have repeat scheduling if this is something that happens regularly and Maurice you had said a lot of people use it for meeting reminders as well. Just pulling a team together for a meeting. You can even set that and forget it. You know, set it and forget it for the next three quarters if you want. All right? In a message like that, we also have a "remove when read." Once they've clicked on that link we can clean it up, it's not on their computer anymore. They're not gonna need to see it again. So it's not gonna display and they don't even need it in their message history to look at later. All right. So let me know if there's any questions. You know what? Right before I go into analyzing what works, what I'd like to do is come to...I wanna come over here and just show you the Administrator portal. So this is the interface that we have for a ticker. And you can see at the top here we have a button for multiple headlines or single headlines, and the two areas where you'll find controls, display options, this is the area here. And we do explain every one. So there's even more in here, and I'm not gonna go through every little item. Some of these are quite specific to different scenarios. For example flag new headlines. That's great if you're doing a regular, daily news feed to your contact center. We can put a little icon next to the ones that have changed. Maybe some are running for five days and some are brand new today. So you can do that. Lots in here that you can do. You have new items that appear if you do a multi-headline ticker that let you set up your visuals and all of that. Okay. And then the Advanced tab if I come over here. This is where we control things like docking and we can set how many times that's gonna scroll. Okay. And all those little orange buttons, they're going to give you an explanation of what each item is. Okay. Now analyzing what works. Once you've used this, you know sent text messages to yourself, you get a feel for the settings that you prefer. What you think really works. But you really wanna test and we have full reporting. All the detail that you want, that you need in order to see what's working, what's not. So if your goal is to make sure that everybody in the next 10 minutes sees that notification about the outage that's happening, that's mission critical, you can go into the report, the content display report and see exactly what percentage of the audience that you targeted received it and interacted with it within that timeframe. How many people clicked through? How long did it take? If you're using repeats, the recurrence feature, you can see on average how many times does this scroll on screen from my users? And you'll find best practice is going to be just a few times you're probably gonna get an average of once to three times for repeats. But you're gonna see what's working. If you go in and you see okay these messages are repeating 17 times before somebody clicks on them, then you probably wanna go and have a look at who that person is and why they aren't clicking. Usually the problem is they don't know they're supposed to click because nothing has been underlined and nobody told them that it was clickable. But all that's in here. If you know what outcome you want, you can come in here and validate that that's the outcome you got. And don't forget that some...go ask people what they like. So we have customers that have set up focus groups to talk to people and find out what's gonna work for them. Of course pilots as well. I know Wyndham Vacation group that they did a massive pilot just to make sure that what they were sending out really worked for the workflow of their contact center people. You can set up champions do surveys. Just ask them and they'll tell you. And if you get it wrong, they'll definitely tell you. And lastly, consistency. Once you figure out what really works, you can go into the default area. So you have to have management rights but you can come into the default section here and set up your preferences in terms of how you want this to display. So that means all of these options we've gone through, you don't actually have to go through them every time. You can preset them and just come in, create. Everything is already set. You just check, you know check the key boxes and you're away, you don't have to take 10 minutes to send out a ticker. It'll be much faster than that if you use the defaults. And for tickers you can see you know headline only, headline with a hyperlink. You can preset that, you can preset your frequency or even the speed. I haven't even spoken about being able to control how fast that headline scrolls on screen. So of all these you can preset so that it's really easy once you know what's gonna work for your audience. And this now alert versus ticker. Now popup alerts. I think most of you know we also have that tool where you can send a popup alert on screen. And this is one question we get all the time. "Which is better? What's better to use alerts for? What's better to use tickers for? You know how do you suggest we use these two tools in tandem?" So I wanted to talk about that. The answer is funny, we really don't have...There's no absolute in terms of which is better? I've listed a couple of the differences on the right here. So for alerts, you don't get the movement that the ticker gives you, right? But for alerts, we do have an option where we can cut through screensaver mode and even get this on screens where people aren't active. So that's a difference. And then tickers, you can get a really long headline. If you wanna to put two sentences in there and that's all you need to tell them, you could get that out in one ticker. Alerts is gonna be a shorter initial message. So it really depends, but what we found, some companies...It's quite interesting, some companies tested the two and had people say, "I hate the ticker, I don't want the ticker, I want alerts. Alerts are much better." And we've seen vice versa. It's really interesting. We can't say there is one standard about what people prefer. Maybe we should look at age one of these days, maybe it's a millennial thing, I don't know. But I would say best practice is test with your audience and then choose one of these alerts or tickers for critical importance don't miss items, right? Like don't dilute it with other stuff. If you reserve either alerts or tickers for mission critical then people will know when they see that that it's hugely important. And then the other one you might give to departments or divisions or you know health and safety reminders here, corporate messaging here,you could use it for multiple things. Use visual cues but have it more for that business as usual type messaging. One contact center did that alerts. They used alerts all the time for lots of different things, and it was tickers they used for emergencies. And when their staff saw a ticker scroll on screen they knew that it was extremely important for that to be on screen. So it's really up to the company though. I don't know Maurice if you have examples too of how you've seen people use this. Maurice: You know, I would agree with what you've said. I've heard on both sides. Some prefer alerts for you know very time-sensitive messaging and some prefer tickers. So it just seems to be a corporate cultural preference thing in my observation. Paula: Okay. Good. Because I was going through my little list of alerts versus tickers, so I'm like, "You know it's not helping me. I can't really make a recommendation." Yeah. So yeah, and that brings us to the close. And I think I've stayed pretty much on time, which is great. So hopefully that's given you some insight into best practice for this ticker. You know you wanna pay attention to your message in the visual template but delivery you know the sky is the limit in terms of how you want this to appear on screen. And it can be used for so many different things, so many different levels of information transfer and you know driving action that hopefully the settings are in there that would make sense for you. So before we close, I would like to... let's see who's left. We still have some people left. Yay. I'm gonna launch now that we've gone through, I'm gonna launch this question. And it's a very simple question. What do you think of the tickers and what sounds valuable to you? Just let us know. Interested to know what you think. I've got a question on screen, you can tick as many of these as you like. So I'll see if anybody answers. No answer...Oh, there's one answer, oh good. Yeah. Hmm. Well, we've had just a few people answered but headline with hyperlink. That is such a fantastic use for the ticker. Driving people to your existing results. It is fewer click throughs I think with the ticker than with other tools. So good to know. Maurice: Can I make one comment there, Paula? Maurice: I have had multiple companies talk about using the ticker, especially a ticker with a hyperlink embedded to drive traffic to their SharePoint or their intranet. It's been for many of them a phenomenal tool for driving traffic to their intranet. So that maybe one of the heaviest use cases I hear for tickers. It's just really getting that traffic up to your know their internal information. Paula: Cutting through more than email can. You know, you're just gonna get a smaller percentage. For something like the ticker you get a much, much higher percentage of your audience responding within a much shorter time period. Yeah. Great. Well, that's it in a nutshell. And listen all, we'll send out a couple of links. There's a guide that goes through every little setting if you wanna explore further in more depth. I'll send through the slides. And please reach out if you have any questions, if you wanna test anything in [inaudible 00:37:57] ticker. And try it out. Thank you everyone. Thanks for coming, and we'll wind it up here. Paula: Thanks, Maurice. Thanks again.